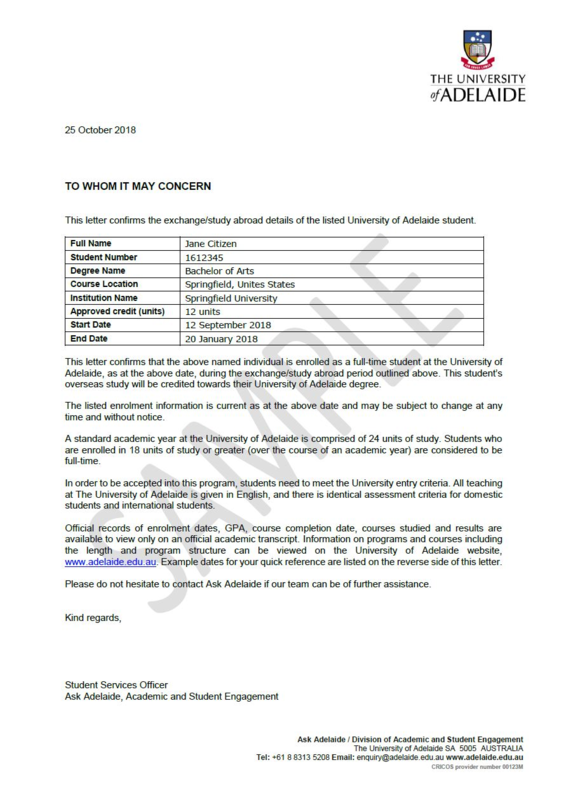 Ask Adelaide can issue official letters to confirm various aspects of your study at the University of Adelaide. Please allow up to five working days for your letter to be issued. Non-standard letter requests, and for letters including pre-1985 records, please allow up to two weeks. 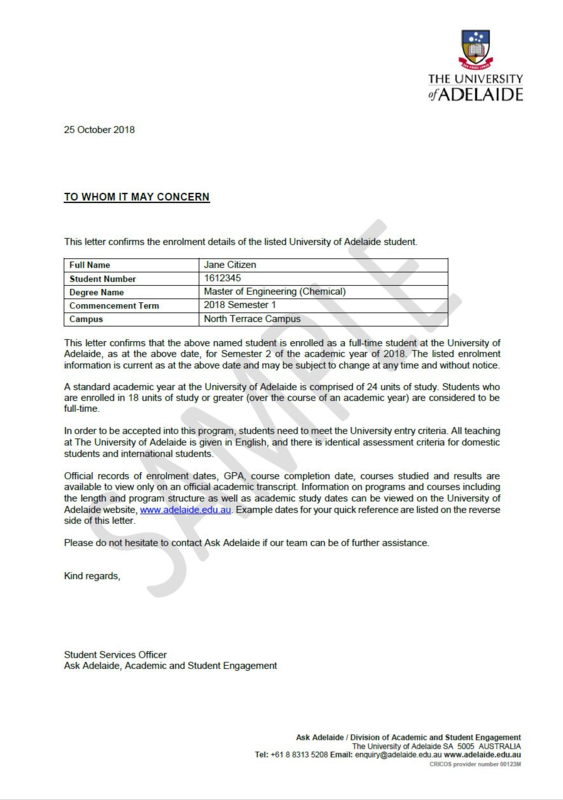 It is your responsibility to check your records, ensure you have no outstanding debts with the University and include all relevant information before submitting your request to avoid delay. Please select carefully as there are no refunds. Need something else? Request a non-standard letter via this online form. You are eligible to receive one free enrolment letter each study period and one free conferral letter at the end of your program. Please specify which study period you need verified in the ‘Notes/Comments’ section at checkout. Verify you've completed your program and are a legal graduate of the university. Free for degrees conferred in the most recent conferral round. Please let us know which degree you need verified in the ‘Notes/Comments’ section at checkout. Verify you've completed your program. If you have studied more than one program, please specify which program you need verified in the ‘Notes/Comments’ section at checkout. Verify you've completed your program and are a legal graduate of the university. If you have studied more than one program, please let us know which program you need verified in the ‘Notes/Comments’ section at checkout. Verify your full-time or part-time enrolment. Please specify which study period you need verified in the ‘Notes/Comments’ section at checkout. Are you an international student and want to work full-time during uni break? Please let us know which break period you need verified in the ‘Notes/Comments’ section at checkout. If your family requires a letter for visa purposes, please follow this guide. 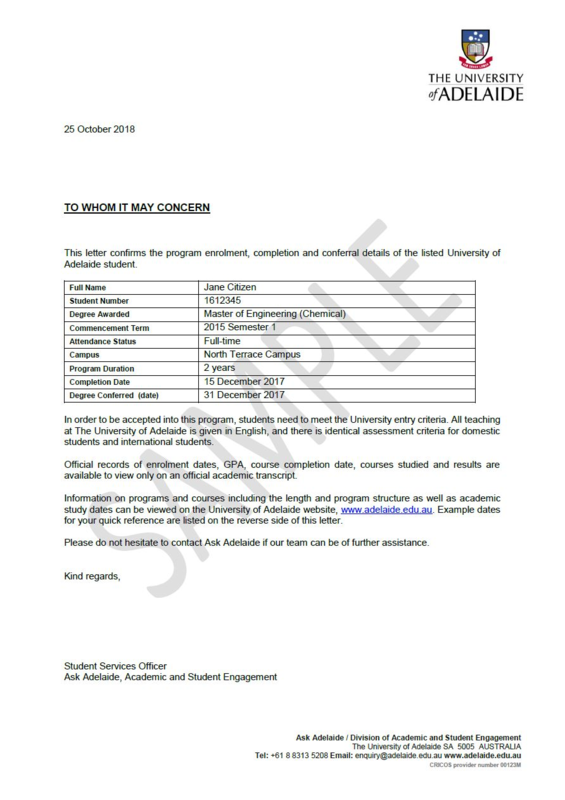 If you need a letter confirming your graduation ceremony details, please submit a non-standard letter request form. You will receive a digital copy of your letter. If you have elected to collect a printed copy, you will be contacted when it is ready. Photo identification is required when collecting your letter. You may nominate someone else to collect your letter. Please provide their full name in the ’Notes/Comments’ box at checkout, and they must also bring their photo identification with them. +$60 International post (Australia Post express international). +$12 Need it fast? Upgrade to express processing. Express requests will be processed on the same business day, if requested before 3 pm (Adelaide time). Not available for pre-1985 records and non-standard letters. Letters are based on your official academic transcript and can only verify current or past information. It is not possible to verify any future details. If you have recently completed your studies, please check that your transcript reflects your request, and there is a completion or conferral row.